SANTA CLARA, Calif. — The Federal Aviation Administration issued a license today (July 26) to the private spaceflight company Armadillo Aerospace, a move that allows the firm to launch a new reusable rocket on short space missions. The reusable launch vehicle license was awarded to the Heath, Texas-based company Armadillo Aerospace, a firm founded by Doom computer game developer John Carmack, to launch commercial flights of an unmanned rocket called STIG B into suborbital space from a New Mexico spaceport. The first flight under the license is slated to launch in late August, company officials said. "We are hoping to launch 24 flights within a two-year period," said Neil Milburn, vice president of program management for Armadillo Aerospace, after receiving the FAA license at the NewSpace 2012 conference here today. The company has always maintained a goal of launching a rocket at least once a month, he added. With the license in hand, Armadillo Aerospace plans to launch commercial payloads into suborbital space on the STIG B rocket and return them to Earth. The company also hopes to serve NASA's suborbital rocket launch needs for the space agency's Flight Opportunities Program. The first mission, dubbed STIG B-1, could launch by Aug. 25 or 26. It will carry microgravity experiments for Purdue University and company Vega Space, Milburn said. Armadillo Aerospace's STIG-B rocket stands 35 feet tall (10.6 meters), is about 20 inches wide (51 centimeters) and uses liquid oxygen and ethanol for fuel. It is designed to launch 110-pound (50 kg) experiment payloads to an altitude of 62 miles (100 kilometers), experience three minutes of weightlessness, and then deploy a supersonic balloon parachute — called a ballute – to protect it as it re-enters Earth's atmosphere. A balloon-parachute recovery system was deployed during a Jan. 28, 2012 flight of an Armadillo Aerospace rocket. 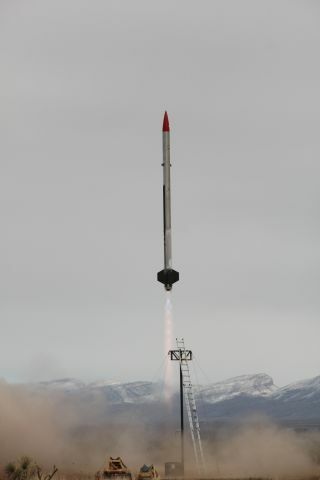 The rocket launches from a vertical pad at Spaceport America in New Mexico and is expected to use a GPS-guided steerable main parachute to slow its descent after re-entry. "The entire system is reusable," Milburn said. "We hope to be able to go launch again, if not in the same day, then within 24 hours. The goal is to reach a point where all we have to do is gas up and go." The first STIG B mission, however, will likely not lead to a quick turnaround, Milburn said. He expects company engineers will want to examine the rocket in detail to see how its components withstood the rigors of spaceflight. The upcoming STIG B rocket launch will come about seven months after Armadillo Aerospace's last launch of its previous rocket, the STIG A booster, in late January. That Jan. 28 test flight hit a snag when its ballute failed to work as expected and the spacecraft fell back to Earth. Milburn said Armadillo Aerospace has learned from that experience and will be able to continue to refine the STIG B rocket during its many anticipated flights. The lessons learned from the STIG B flights, he added, will help the company with its future vehicles as well. In addition to its unmanned commercial rocket launches, Armadillo Aerospace is developing a two-person space capsule to carry paying passengers into suborbital space. That vehicle will launch and land vertically, and is primarily expected to be used to for space tourist flights. Armadillo Aerospace is developing the spacecraft with Space Adventures, a Virginia-based company that is selling trips on the new vehicle for $102,000 a seat. But the passenger spaceship will come later. First, STIG B has to fly successfully. Milburn said that rocket testing — and not the FAA licensing process — has taken the most time. The STIG B rocket is currently in pieces awaiting final assembly, with its integration tests planned for its two experiment payloads. "We've still got a lot of work to do before we can launch," Milburn said. Follow SPACE.com on Twitter at @Spacedotcom. We're also on Facebook and Google+.